PALM HARBOR, Fla. – On day three of Caddie Week, reality began to set in. The start of the day was a snap; we headed to the course and I sat on my thumbs in the caddie lounge, studying the yardage book while Martin headed to work out at the Tour truck. But when he finished, it was time to finally take the staff bag for a whirl; we set out for the practice area and a quick warmup before tracking down our Pro-Am group. The Pro-Am itself went off swimmingly. The new Tour policy offering nine holes per pro seems like a wise move; Tyrell Hatton played the back nine before tagging off to Martin for the front. This way, players can stay fresh and happy, plus the groups of ams gets exposure to twice as many Tour players in the process. Win-win. One of Martin’s pro-am partners had a particularly unique side-saddle putting method. He hadn’t mastered it. The competition itself was essentially controlled chaos. 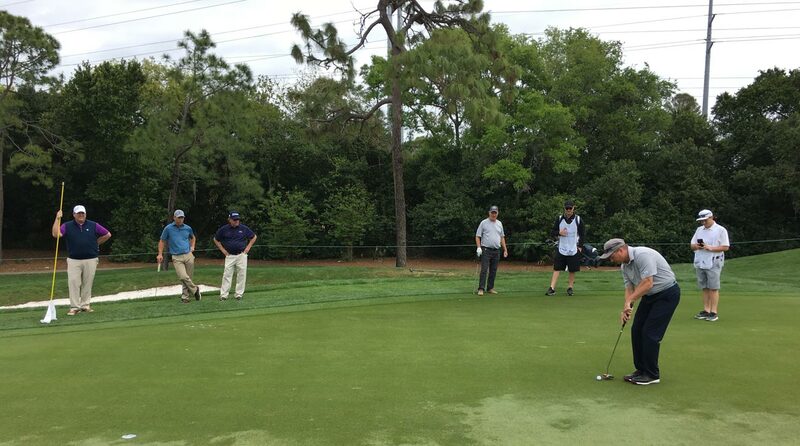 Four ams plus a pro makes for a bulky fivesome, and Innisbrook’s Copperhead course is currently set up for the pros more than any 15-handicapper. Balls were flying every which way. Some Martin highlights: he birdied No. 1, a par-5, with a good driver-3-wood and a neat chip to two feet. He also birdied No. 5, the other par-5, chipping in from just off the front edge. There were a couple delicious snack stations, one with a crabcake avocado open-faced slider, another with some sort of barbecue, maybe brisket. 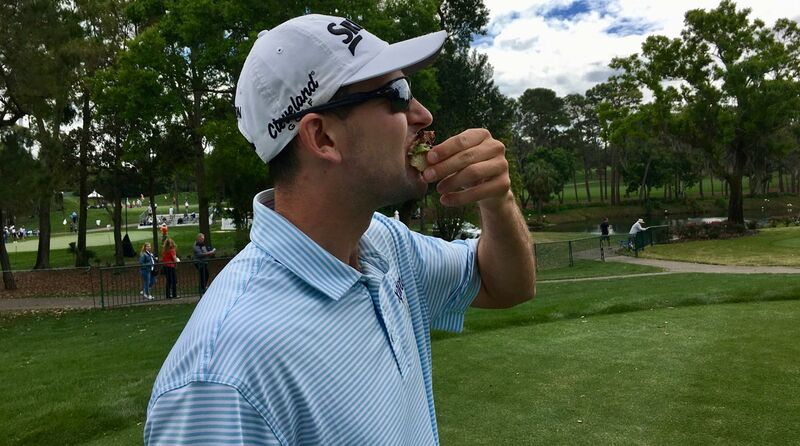 Martin Trainer chows down on a crabcake avocado open-faced slider – a big-time win. But the real lesson from two days of scouting is that the Valspar is going to be tough, and scores won’t be crazy low – this is a week pars seem like they’ll do okay. A bunch of holes at the Copperhead allow for a layup or threading a driver either through a small target or smashing it up and over. Martin’s biggest weapon is his driver; I think we’re going to use that weapon to our advantage. Driver everywhere! What did I learn? I sent John Wood, Matt Kuchar’s caddie (and GOLF.com contributor) an email asking a simple question: Any advice? Here’s what he told me, and what I’ve felt so far. Not a tournament day, so I’m good. But we’re traveling in together each day, making the one hour early thing a no-go. I will have to make up for it in preparation. 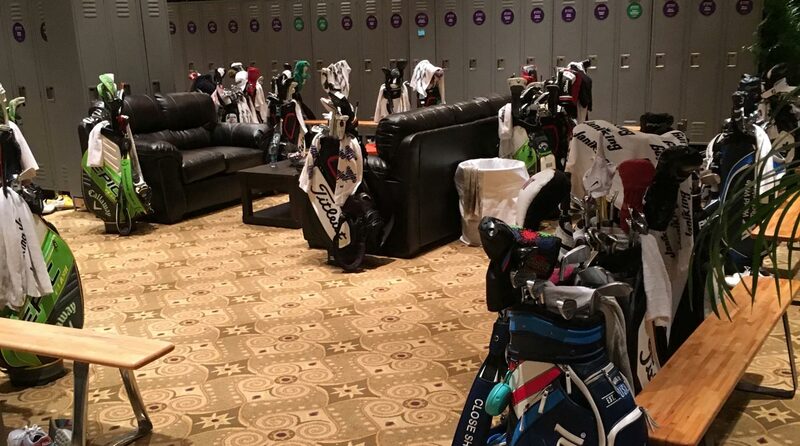 Interesting note from the locker room: I was surprised how many guys left their bags there overnight. And if you’re a club thief reading this, just don’t steal Martin’s. The thinking ahead can actually be kind of tricky, I found. There’s a lot to do just to keep up with the group, especially lugging the big staff bags. Between getting yardages, wiping down clubs, selecting the next one, grabbing the pin, grabbing a read, making sure you’re not in the wrong spot, etc., there’s plenty going on. The other tricky aspect is figuring out how much to tell him. Because we’ve never worked together before, I don’t know how much is too much information. He generally likes to keep things simple, or at least work through them in his own process, so I’m erring towards giving concise summaries of need-to-know info, but the fact that he hasn’t played this difficult course before means there’s some more plotting than usual required, too. 2. Don’t be afraid to go off topic during a round. Get a feel for whether he wants to chat in between shots about other things: family, interests, restaurants, books, movies or sports. No one can fully concentrate on golf for five hours. These can be used to relax your guy, especially if something bad has just happened during the round. It kind of reminds them that the eight-iron they hit in the bunker on the previous hole isn’t actually the biggest issue in the world. It’s not. This was more comforting advice, and feels directly in line with Martin’s personality. He gets most excited working through bizarre rules hypotheticals (last week at the Players, he posed this one: if you shank it onto the island to the right of the green at No. 17, can you request a boat to take you out there to play your shot?) or nuances of tournament branding. (“What event is the biggest mouthful?” he mused with Dylan Frittelli on the range. Frittelli supplied The Justin Timberlake Shriners Hospitals for Children Open, which was more than satisfactory.) The only tricky part is exactly how and when to lock back into the shot at hand, but that on/off switch is what makes top pros so good at tournament golf. 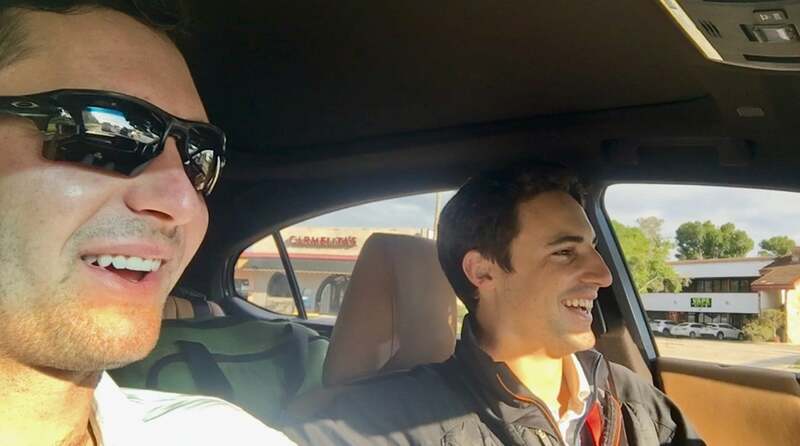 Just a golfer and his (brand new) caddie sharing a laugh in the car. 3. When raking a bunker, use the smooth side of the rake to level the sand first (especially where his feet were dug in and he took the swing) then the side with the teeth. Try and be even-handed with the rake and don’t create big ridges by putting too much weight on one side or the other of the rake. This was helpful, yet also made me more anxious at the same time. 4. The one that’s a little complicated is raking the other guy’s bunkers. You’ll want to rake someone else’s bunker when it’s still going to be their player’s turn to play. For example: Say your pro drives it in the fairway and another pro drives it into a fairway bunker. Your guy hits it on the green while the other pro hits from the bunker and fails to reach the green. It’s still going to be his turn to play. If his caddie has to rake the bunker, it’s going to cause a big delay in play. So you’ll offer to him, “I got it, go ahead,” and he’ll do the same in the opposite situation. When in doubt, ask the other guys in the group…best to ask than be in the dark. I hope Martin just avoids all bunkers this week. But after a couple slow, mediocre raking efforts during the pro-am, I hit the course just before dusk for some extra practice. My nightmare is what happened to Kevin Kisner’s caddie, Duane Bock, at last year’s PGA Championship, where he owned up and apologized for not filling in a footprint which Gary Woodland then hit into. We’re playing with Kisner and Bock tomorrow; I’m not sure I’m going to bring this up. Caddie Chronicles, Day 2: Getting to know my boss — plus, my first caddie care package! But enough about anxiety; not long after we came in from the pro-am, I felt completely at ease in the player’s locker room. That was thanks to the gentle, earnest enthusiasm of one James Kenneth Perry, who sat across the lunch table from Martin and I for over an hour, gamely answering questions, sharing musings and giving advice. This, the day after we talked to Ted Potter Jr. at length and in detail, too. I had no idea these long talks would happen. Selections from Kenny: The last time Kenny played a Monday qualifier, he thinks, was at the 1984 Honda Classic. He says he was second to John Daly in driving distance one year on Tour in the early 90s, but even now at age 59 he’s carrying the ball further than he did then. He was absolutely devastated by losing the ’09 Masters and remembers every shot gone wrong to this day. In contrast to the carefully managed schedules of Tour players now, Perry remembers his tournament prep: Travel Monday, play 18 Tuesday, play the 18-hole pro-am Wednesday, play 72 holes, then do it again. Wash, rinse, repeat. “I once played 13 events in a row,” Perry said, “and I hadn’t won a thing until I won the 13th. That’s why it’s so hard to know when to take a week off. Above all, what came across was the joy Perry feels being around the PGA Tour. “What’re you still doing here?” one player asked, seeing Perry was still in the same seat he’d been in all of lunchtime. “Just being the mayor,” Perry said. That felt appropriate. He’s on a Kobe Bryant-style retirement tour, playing his favorite stops again for the year – but unlike Kobe, nobody really knows about this one. I suggested he should be demanding more gifts, a la Kobe or Derek Jeter. A custom-made tractor from the John Deere Classic, perhaps? He liked that idea. “I just like being around the scene, seeing how good all you kids are,” he said with a grin. We’re off at 8:24 a.m. Thursday morning. We’ll try to bring some of that Kenny Perry easy living comfort when we go.